Check out my post entitled “A Feathered Reptile”. For more information about Common Nighthawks, visit Cornell Lab of Ornithology’s All About Birds web site. 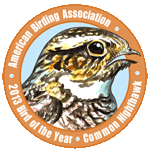 Below is something the American Birding Association posted when the Common Nighthawk became their 2013 Bird of the Year (and included this fun video). “Nighthawks keep a foot in two very different realms. They share the mottled camouflage and retiring daytime habits of their Whip-poor-will and Common Poorwill brethren, but nighthawks also venture forth into the open during the day. Nighthawks are full of contradiction: shy at times and dramatically demonstrative at others, often silent and often louder than any other evening creature — familiar, exotic, and strange. The display flights of male Common Nighthawks end with a distinctive ‘boom’ at the bottom of their dive – a loud sound produced by air rushing through the nighthawk’s wing feathers. The dives can be directed at females, territorial intruders, and people. Common Nighthawks nest on gravel roof-tops and sparsely vegetated grasslands. Nighthawks don’t build nests, but lay their camouflaged eggs directly onto the gravel. The name refers to the nocturnal or crepuscular habits of the bird and its long-winged, falcon-like shape. Its loud and distinctive buzz peent is often heard before the bird is seen. Most often observed in the morning or evening while feeding on the wing. The flight habit is often described as ‘bat-like,’ but there is also a powerful grace to the species’ direct flight. Its most conspicuous marks are the white outer wing patch and white throat patch. Though one of the most frequently seen of the nightjars, the Common Nighthawk remains poorly understood. Declining in numbers in parts of its range, the Common Nighthawk is now listed as threatened in Canada and is a species of special concern in several states of the US.